UPDATED: Wed., Aug. 30, 2017, 12:55 p.m.
b17anderson: Hey Theo! Thanks for the great coverage so far. Aside from Martin Jr., who’s been your favorite (or most exciting) receiver to watch this past camp? srchat (Admin): I’ve been real impressed by Isaiah Johnson-Mack, who I’ll call IJM throughout the season because it’s shorter and I figure I’ll be using it plenty. Has great range, great speed for his range/size and really physical. He’s made a lot of good WSU DBs look bad during camp and I think it could be a big fall for him. Guest1 (Guest): First, I appreciate the work you do. YouWhat are they doing differently this year to avoid losing to an FCS team in the first game? srchat (Admin): I don’t think there’s a whole lot. They’ve held more night practices/scrimmages to simulate the atmosphere and I think they’re leaning on their experience to get them through some of the mental blocks that we’ve seen the last few years. I know they’re sick of hearing about it though. Its Me (Guest): Here’s a format question for you. Are you going to have a Blog or other composite site for all of your stories?Vince Grippi links to your features in his blog every morning, but for those of us with an electronic subscription, what’s the best way to find all of our content other than finding your twitter posts in our timeline? BW (Guest): Cougs D-Line/LB’s are near the bottom of the PAC-12 in size (maybe smallest?). How will they handle teams that want to dominate the run game and line of scrimmage? Seems like their biggest weakness heading into the season. srchat (Admin): Well, they’ve been pretty strong against the run relatively speaking. They were 3rd in the Pac last year with 134 yds allowed per game. Bigger concern is getting to the QB. They haven’t been able to recruit the size/strength that say UW,USC or Stanford has, but I’d imagine pound for pound, Hercules Mata’afa is one of the stronger players in the league. And this is a speed-based offense anyway, so the lack of size isn’t too concerning from their standpoint. Guest6749 (Guest): Where is Esop Williams on depth? How about #95 Tapa? srchat (Admin): Easop didn’t crack the two-deep we got earlier in the week. But he’ll get in there at either of the inside WR spots,especially if Rob Lewis is still limited. Tapa left the team in the offseason. Guest3773 (Guest): Thanks for your hard work covering WSU football! Which coug players do you think could have a shot at getting drafted in the next 2 years? srchat (Admin): Luke Falk, Cody O’Connell, Hercules Mata’fa, James Williams. 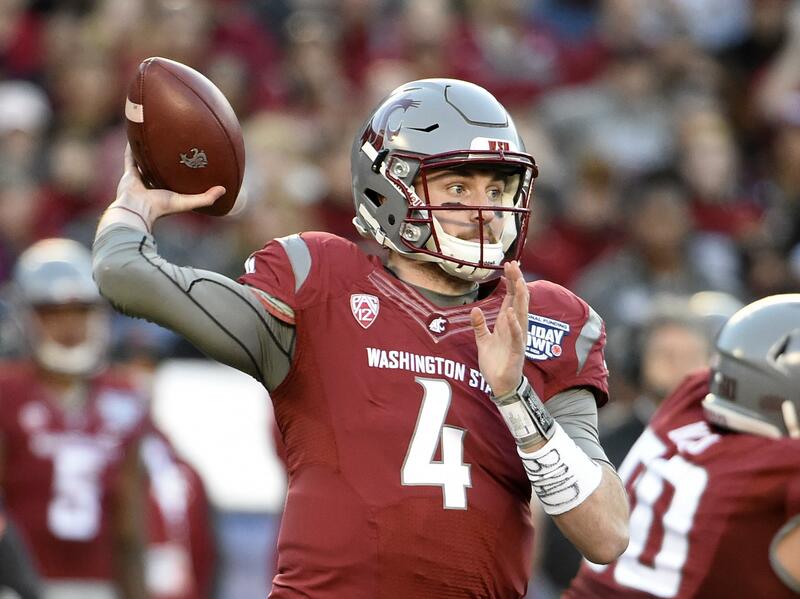 Guest4903 (Guest): Will WSU struggle again this season when facing a “running” quarterback? Why/Why not? srchat (Admin): The QBs that have given them trouble have been runners and throwers. Mont. State’s Chris Murray isn’t much of a thrower, so I think he’ll be more one-dimensional than the guys we’ve seen. JESSE COUG (Guest): You’re probably sick of hearing about the D line issues, but why has it been so hard to get these guys to WSU, looking at next years recruiting we still haven’t landed anyone either? srchat (Admin): As I alluded to earlier, the big schools in big cities seem to get the prototypical huge/fast D-linemen (SC, U-Dub,Stanford) for whatever reason. Utah, too… There aren’t a ton of them around is my guess. Guest2844 (Guest): Noticed Tay Martin made the depth chart, how has he looked in fall camp and do you think he’ll see the field at all this year? srchat (Admin): I think he plays as a freshman, though it’s hard to tell in what role. Maybe they carve out a special teams spot for him. The outside receivers are deep and especially at the “X” where he plays. Don’t imagine he’ll leap Tavares Martin or C.J.Dimry soon, but this offense cycles through wideouts in a game more than almost anyone in the country, so I bet he gets a few opportunities. SKramerWrites: Do you think WSU will start throwing the ball much at all this year? srchat (Admin): Nope. Wishbone and wishbone only. srchat (Admin): Good day, sir! Guest4369 (Guest): Without getting in trouble…..how many yards do you expect Rob Lewis to get this season? srchat (Admin): Just so I don’t get into trouble … more than 1. Guest6664 (Guest): Any true freshmen on the 2-deeps that have caught your eye? srchat (Admin): Jamire Calvin, “Tay” Martin and Travell Harris on offense. George Hicks III and Fa’vae Fa’vae on defense. Onedayish (Guest): What has been your biggest surprise about the team in your first year covering them? srchat (Admin): I was covering mid-major football before this (on the other side of the border). I think it’s easy to take for granted the caliber of these athletes in the Pac-12. It’s just a different breed of animal than what I’ve covered in the past. CougSchroed (Guest): How have Jamire Calvin and Travelle Harris, 2 true frosh, seemed to pick up the offense thus far? Knowing where to sit in zone, knowing where to run the route on 4 verts, etc? srchat (Admin): In terms of actually picking up the offense, I might say Harris has been a little better. Calvin’s the better athlete with the higher ceiling, it would seem, but Harris has looked more fluid especially since coming back from Lewiston. JESSE COUG (Guest): How has Hunter Mattox and McBroom looked? havent heard much about our back up D tackles this fall? srchat (Admin): Jeff Phelps seems to think they have good depth on the D-line, contrary to what many of the fans/media have seen. I haven’t spent too much time on the second D-line, so we’ll see… McBroom is the backup to Ekuale for now, though. NussCoug: I do think Mike Leach needs to do a wishbone tribute at some point. That would be so Leachy. srchat (Admin): I hear he’s on Twitter. You should mention it. Guest4398 (Guest): Hows Jamire Calvin look? Whats your take on his output this season? srchat (Admin): Was really high on him while they were in Lewiston. Still am, but his routes probably aren’t as crisp as they could be and he makes the occasional rookie mistake. For example, during a scrimmage he jumped in front of someone else’s route and tried to grab a pass intended for the other guy. Luke Falk was very, umm, vocal when that play ended. He has a ways to go,but the ceiling is very, very high. Guest4369 (Guest): We know the defense is experienced….but do you think they have enough talent to be elite? And where is the talent gap the biggest still? srchat (Admin): On a scale from Arizona to Bama (Arizona being 1, Bama being 10), I think they could be a 6, or possibly a 7. I’ll say the secondary for now. You’re slightly worried about the right CB spot, where Marcellus Pippins never really asserted himself as the No. 1 guy over sophomore Marcus Strong. bkransford: It’s pretty clear that Nnamdi Oguayo is a Heisman front-runner entering his sophomore season. How has he looked in practices? srchat (Admin): I can see it. Nnamdi and Charles Woodson, the only defensive guys to win the Heisman. He’s looked stellar since returning to practice. Was “limited” for close to two weeks, but seemed like he didn’t skip a beat when he returned. Think his length could pose some problems and he’s deceptively one of the faster defensive players they have. Guest3799 (Guest): Last year, both RobLew and Cracraft run blocked well on the inside. How has the new inside WR crew done blocking? And has that been prioritized as much given the learning curve in route running? srchat (Admin): Imagine they’ll have some lulls in that area without those two guys in the mix. Kyle Sweet’s a good blocker and the younger guys (Renard Bell, Jamire Calvin, Travell Harris) are putting forth the effort, but I think that’s one of the tougher transitions to make from high school to D-I. A lot of those guys weren’t asked to do it at the prep level. JESSE COUG (Guest): Are you surprised Hicks made 2 deeps over Josh Talbott, considering Talbott was one of our best recruits? srchat (Admin): Based on the discrepancy of their recruiting profiles, maybe. Based on what I’ve seen both the first month, not at all. Hicks has clearly earned that spot. CougSchroed (Guest): Easop Winston looked great at the spring game, I was confident he would be 1 of the 4 Inside Receivers in game 1. What has happened throughout fall camp? Lack of effort? Lack of talent compared to other IR’s? srchat (Admin): Yeah, didn’t cover them in the spring but from what I’ve heard, apparently Falk thinks he has the best hands of any WR he’s played with. He’s not the athlete that Bell, Harris or Calvin is, but I think you’ll see him in some capacity the first few weeks of the year. Guest3799 (Guest): In 2013, Leach would occassionally stick some of his big outside guys (like Kristoff Williams) at the Y to create mismatches on the inside. Any chance we’ll see some of that early on?? srchat (Admin): They’ve experimented a bit with “Tay” Martin on the inside and I think that could be a real good fit if he feels comfortable there. And they have so much depth on the outside, it couldn’t hurt to at least try it out. Think he has the athleticism to play inside, but again, it’s all about the feel. Guest4369 (Guest): Which running back gets the least amount of carries this year and why? srchat (Admin): Keith Harrington, no question. The three guys ahead of him have been full-time RBs since they got on campus whereas Harrington has flipped between RB and WR. I don’t think you can use him the way they’ll use Morrow, Wicks,Williams. JESSE COUG (Guest): How has Robert Valencia looked so far, I was surprised that he wasn’t able to beat out Salmonson? srchat (Admin): He’s been limited for at least two weeks now, so I haven’t seen a lot of him. They’ve had Salmonson with the ones since fall camp began and he’s won his spot there, but I still think Valencia could be the next guy up if either of the guards or tackles go down. srchat (Admin): We’ve got a few more minutes. I can take two or three more questions. Don’t be shy! CougSchroed (Guest): Has the continent been as advertised in fall camp? Mauling defenders? srchat (Admin): He mostly has been. I think he still has a lot to learn from a technical standpoint, but I’ve never covered a human being more massive than him. srchat (Admin): That’s a question above my pay grade, unfortunately. I’d call about it. Though, I think “Tay” Martin (No. 1 on offense) has a bright future at WSU, for what it’s worth. JESSE COUG (Guest): How has Conor Neville looked, does he have a shot to battle Hillinksi next year for the starting spot? srchat (Admin): Falk and Hilinski get 95% of the reps, so it’s been hard to measure anybody else. I’d be surprised if the 2018 starter is someone besides Tyler Hilinski or Cammon Cooper. Guest3773 (Guest): Who are the top candidates for all conference recognition? srchat (Admin): Luke Falk, Cody O’Connell, Cole Madison, James Williams, Tavares Martin Jr., Hercules Mata’afa, Nnamdi Oguayo, Peyton Pelluer. Guest6720 (Guest): Over/Under on Boobie scoring a TD on his first carry of the season? srchat (Admin): I covered Montana State-Idaho last year. They were bad against the run from what I remember. I’ll give it a 20%chance. Guest3799 (Guest): A lot of folks last year—including Brock Huard—tabbed Jalen Thompson for a break-out year this year. Do see him contending for all-conference and how have the back-ups looked like Harper.? srchat (Admin): It’s possible, but not probable at this point. I think they’ve been fine, although I would be a bit worried if Rob Taylor or Thompson went down. Harvey__Road: Shout out to @NussCoug! Theo, when will you be making your opening game prediction? srchat (Admin): My Pac-12 picks will be on the S-R site within the next hour. Gowazzu02 (Guest): I missed the first half of the chat. It looks like the window only goes up to around the 10:30 mark, will you post a transcript of the entire thing? srchat (Admin): I was planning on it. srchat (Admin): OK, that’s all the time I have this week. But let’s do it again. Rather, let’s do it 12 more times. Thanks for the questions and a transcript of the full chat will be up later on today. Also, be sure to pick up a copy of tomorrow’s paper with our college/HS football preview section. We put Leach in an airplane, you won’t want to miss it. Guest3799 (Guest): Thanks for all your work, Theo! Published: Aug. 30, 2017, 12:47 p.m. Updated: Aug. 30, 2017, 12:55 p.m.